We are certainly not vegetarians, but we enjoy eating some vegetarian meals from time to time. And by “we”, I mean I make them and Nate eats them because that’s what I made for dinner. But usually there are no complaints. Not only is eating a vegetarian meal from time to time healthful, but it’s also pretty budget friendly. Quality meat can get so expensive, especially when you have it as part of each meal. I usually only buy meat when it’s on sale – I always stock up on the BOGO sales on chicken breasts because we eat so much of it and it’s such an easy go-to meal. But what’s easier than chicken breasts? No meat meals! Unless I’m using dried beans, there is almost no pre-planning involved because I don’t have to remember to take anything out of the freezer beforehand. Not only that, but it usually comes together in a cinch. Many of my blogging friends do Meatless Mondays, which as the title indicates, is a vegetarian recipe. I thought it’d be fun to try to add more Meatless Mondays into our lives and into my blog. Variety is crucial in a well balanced life. For these stuffed peppers, I didn’t follow any particular recipe, although I did Google how long and at what temp I should cook them for. Didn’t want to waste any of this delicious quinoa salad stuffing! Speaking of wasting…after I had stuffed the peppers, I put the remaining quinoa salad into a container to save for lunches or another dinner. In the morning, I went to grab it out of the fridge to pack for lunch, only to discover that it was gone. And it wasn’t like a little bit, I could have stuffed at least four more peppers. I immediately texted Nate with a sad face asking why he didn’t leave me any leftovers. While I was waiting for a response, I went to grab a container to pack a salad in, and lo and behold, there sits my full container of quinoa salad, in my kitchen drawer. Just then, I received a text from Nate saying sorry, but it was just a little salad. I had completely forgot about the leftover salad, which really was like three bites. I felt so bad for accusing him, though when we talked about it later, he did say he probably would have just taken the entire container to work. Even though it sat out all night, given the ingredients, I figured it would be safe to keep. Don’t judge! But really, that’s how good it was – I couldn’t bring myself to throw it away! The peppers turned out fantastic, and while they don’t look like a lot, eating a whole one is probably too large of a serving. For presentation purposes, I didn’t want to cut the peppers in half, but we easily could have been full on a half stuffed pepper. I mixed a little shredded pepper jack cheese in Nate’s pepper (don’t worry, none was in the “drawer leftovers”) and added a little to the top. 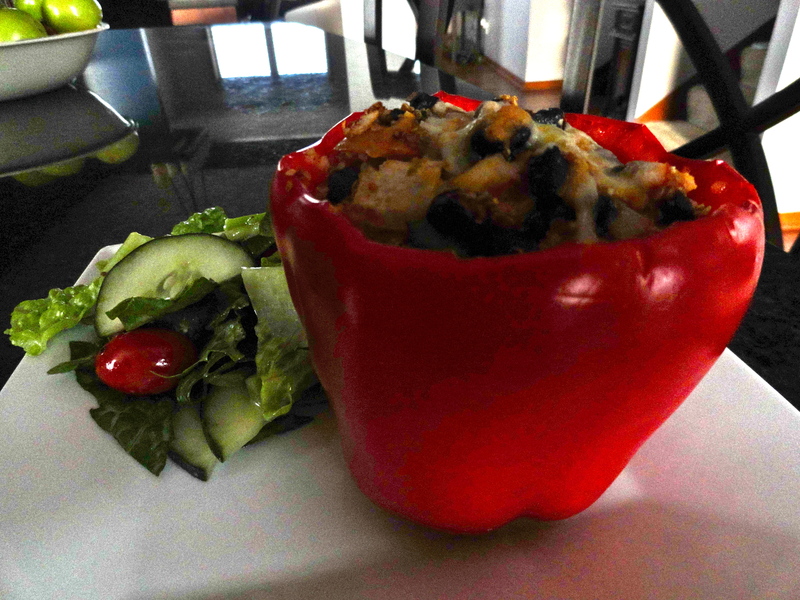 Of course, mine was cheese-less, so for you non-dairy eaters, it was still a fabulous meal! 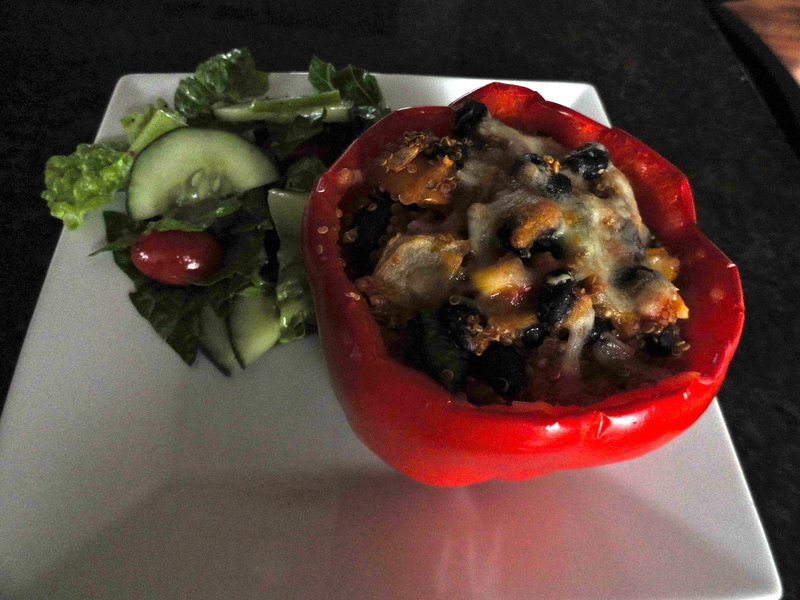 The variety of fresh veggies, paired with the slightly firm pepper was a fabulous combination. Add in a little taco seasoning, and you’ve got yourself a flavorful, healthy and filling vegetarian meal. What would you like to see next on Meatless Monday? 4 bell peppers (I used red, but use whatever color you wish), be sure to choose peppers that have an even bottom so they can stand on their own. 1. Add quinoa, water and taco seasoning to medium saucepan. Bring to a boil, then reduce heat and simmer for 20 minutes, stirring occasionally. Remove from heat and set aside. 2. Preheat oven to 375 degrees. Using a paring knife, carefully cut the top of the peppers off, discarding the stem and seeds. Set aside pepper bottoms and reserve any flesh from the tops and chop. In a medium frying pan, spray with a small amount of cooking oil and heat over medium heat. Add chopped pepper, onion, jalapeno and frozen corn. Sauté for 4-6 minutes, until vegetables begin to soften, but are still slightly crisp. Remove from heat and transfer to a large mixing bowl. 3. 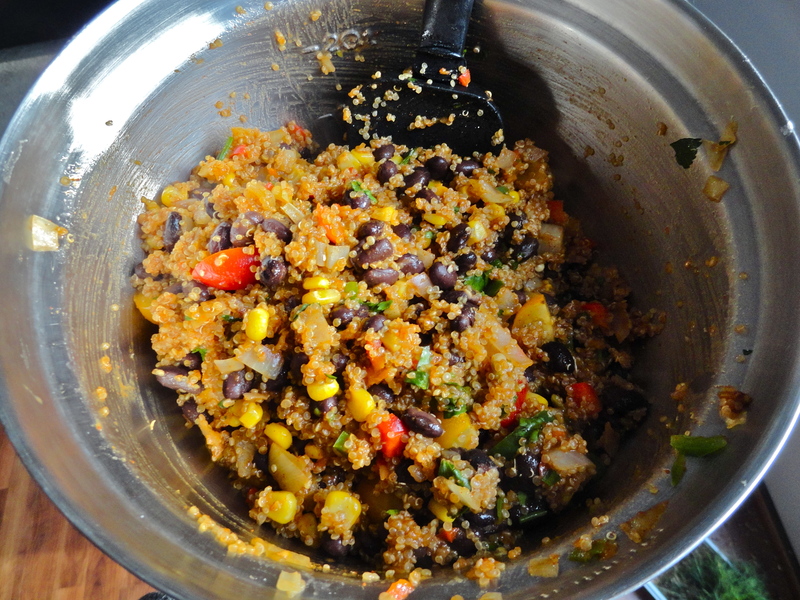 To the vegetables, add black beans, tomatoes, cilantro, cheese (optional) and cooked quinoa. Fold together until well combined. 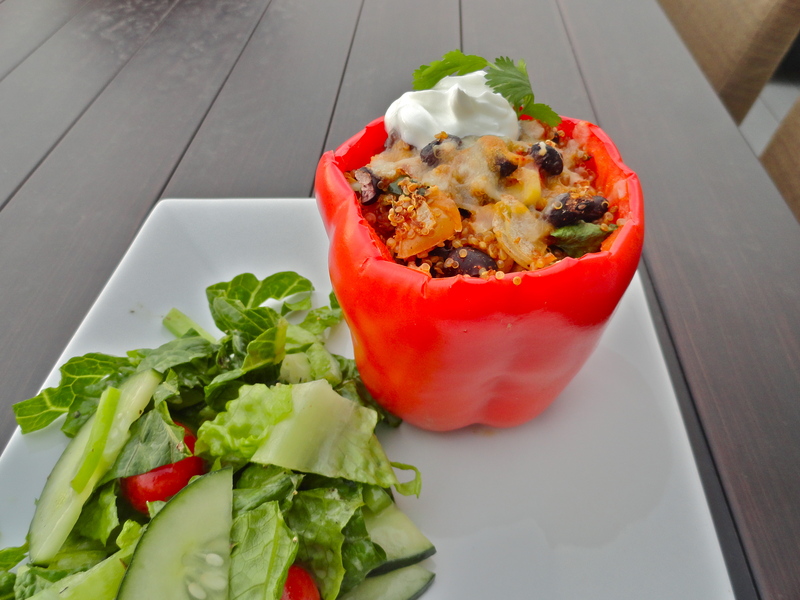 Spoon quinoa salad into peppers. Fill so the salad is barely overflowing the pepper, and top with additional cheese (if desired). Place peppers on foil lined baking sheet or dish (dish is nice in case they try to take a spill) and bake until pepper begins to soften and cheese begins to brown on top, about 15-20 minutes. Remove from oven and garnish with Greek yogurt and/or additional cilantro.